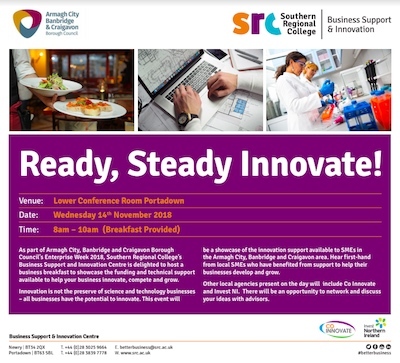 As part of Armagh City, Banbridge and Craigavon Borough Council’s Enterprise Week 2018, Southern Regional College’s Business Support and Innovation Centre is delighted to host a business breakfast to showcase the funding and technical support available to help your business innovate, compete and grow. Innovation is not the preserve of science and technology businesses – all businesses have the potential to innovate. This event will be a showcase of the innovation support available to SMEs in the Armagh City, Banbridge and Craigavon area. Hear first-hand from local SMEs who have benefited from support to help their businesses develop and grow. 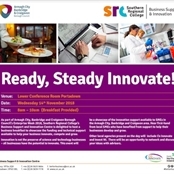 This event will take place in the Lower Conference Room at SRC Portadown Campus. Breakfast will be provided. Other local agencies present on the day will include Co Innovate and Invest NI. There will be an opportunity to network and discuss your ideas with advisors.